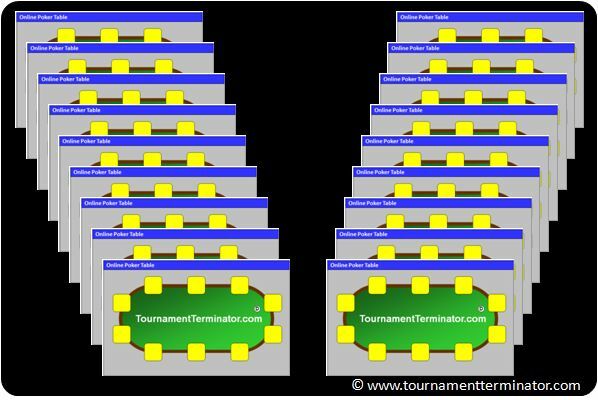 If you have already multitabled poker tournaments such as Sit and Go’s or Double or Nothing’s, you will for certain already have thought about what the best layout of the poker tables on your computer screen is. The table setup becomes even more important when you masstable SGN’s (playing 12 or more tables simultaneously). 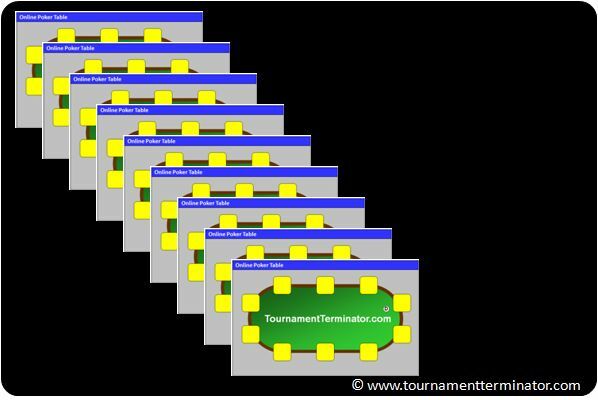 Depending on the minimum table size, which is set by your poker room, and the resolution of your monitor, you should be able to arrange between 4 and 24 tables without overlap on your screen. 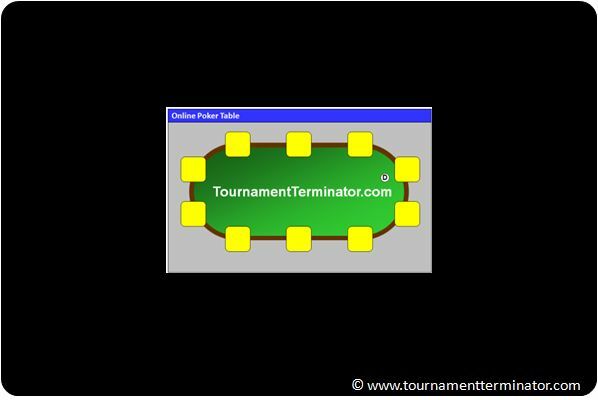 In some cases, however, overlapping online poker tables makes sense when playing Texas Hold’em online, as we shall see below. 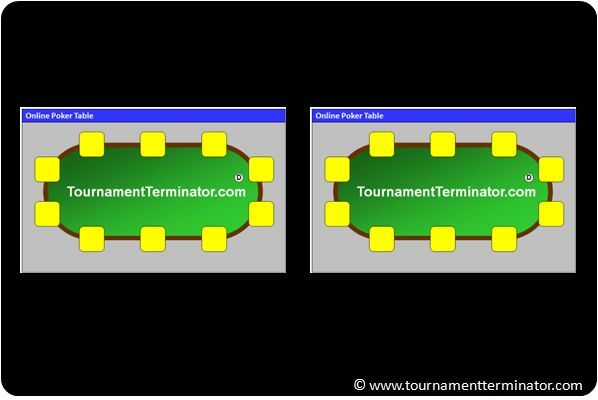 Let’s have a closer look at these three online poker table setups and discuss the benefits of each table setup. 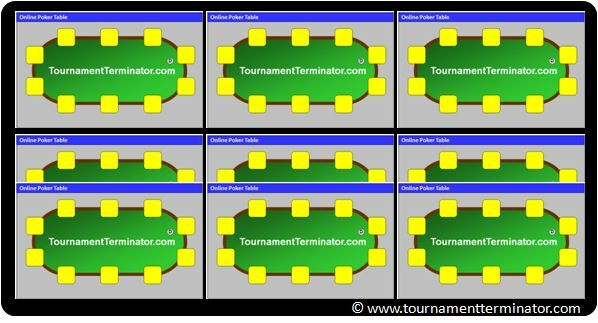 When tiling the poker tables, you reduce or minimize their size and start arranging them from top left to bottom right on your PC screen. When the first row is completed, you start with the second row. Of course you can also arrange the tables in columns, filling your screen from top left to bottom left, then starting the next column again at the top of your screen. If you want to make a change to your arrangement of the poker tables after reading this poker strategy article, we recommend you to test the new method at the playmoney tables or at the micro-limit SNG tournaments. 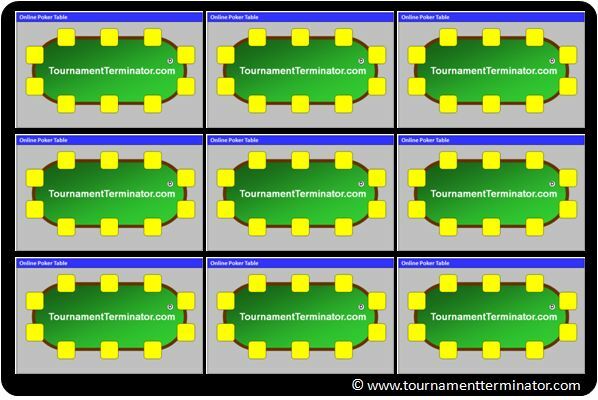 Beginners should start with four tables and use the “Tiled” setup. This allows them to see what happens at the tables, and learn what the effects of their calls, bets and raises are. Only after at least 2,000 Sit and Go’s we recommend players to start playing more than six tables or to switch to another table layout on the screen. Advanced players and pro grinders, who can pass on the learning effect by observing the tables, should play tournaments by cascading or stacking the tables. This allows them to play more tables at once, leading to an increased hourly rate. The layout for the pros, stacked or cascaded, is supported by the software of Party Poker. Sign up at Party Poker (use the bonus code TERMINATE for the maximum bonus of 400$ 500$) in order to play more tables per set, earning you higher profits per hour.